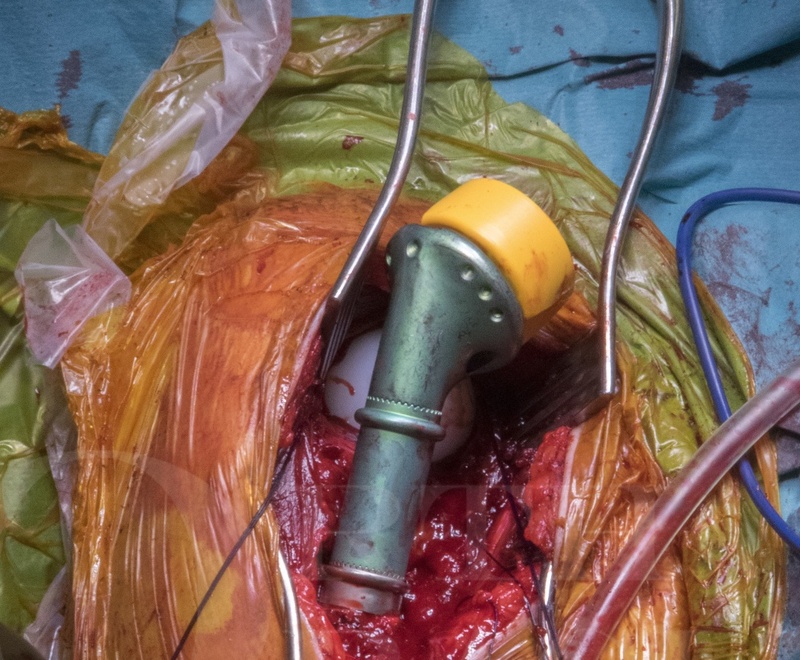 Learn the Proximal humeral replacement: Mutars reverse geometry shoulder (Implantcast). surgical technique with step by step instructions on OrthOracle. Our e-learning platform contains high resolution images and a certified CME of the Proximal humeral replacement: Mutars reverse geometry shoulder (Implantcast). surgical procedure. After the lungs and liver, the skeleton is the most common site of metastatic disease. Prostate, breast, lung, kidney, and thyroid cancers account for 80% of all skeletal metastases. The femur, spine, humerus, pelvis, ribs, and skull are reported to be the most commonly effected sites, in that order. The prolonged survival of more patients with cancer has led to increasing numbers of individuals with metastatic bone disease. Metastatic bone disease is a major contributor to the deterioration of the quality of life of patients with cancer. Impending and actual pathological fractures initiate the period of dependent care for many of them. The majority of metastatic bone lesions are treated effectively with nonsurgical modalities such as radiation therapy, chemotherapy, immunotherapy, hormonal therapy, bone-seeking isotopes, and bisphosphonates. Treatment of pathological fractures with closed reduction and immobilisation has been shown to be ineffective. Gainor and Buchert performed a study of 129 pathological fractures of long bones in 123 patients who had been treated with a variety of methods and followed until death or at least one year after the fracture (Gainor & Buchert, Clinical Orthopaedics and Related Research [01 Sep 1983(178):297-302]). They observed fracture-healing in 87% (twenty-six) of thirty patients who were treated with internal fixation and radiation therapy and who survived more than six months compared with 57% (thirteen) of twenty-three patients who had a similar survival time but were treated with cast immobilisation and radiation therapy. As a result, those authors recommended the use of internal fixation and postoperative radiation. There are of course excerptions. Patients who have a slow-growing tumour that is responsive to chemotherapy and radiation therapy (such as multiple myeloma) and who have a pathological fracture of a non-weightbearing bone may be initially treated non-operatively. Operative treatment may be required for patients with an existing or impending pathological fracture or with intractable pain that does not respond to any nonoperative procedures. Operative intervention for metastatic bone disease is usually a palliative procedure. The goals of surgery are to achieve local tumour control and structural stability of the surgically treated site and to restore function as quickly as possible. Ideally, operative treatment should allow immediate function and weight-bearing with the least possible morbidity and rehabilitation. Operative reconstruction in patients who have bone metastases must also be reliable and durable in accordance with the expected duration of survival, which may be prolonged for patients with breast, prostate, or renal cancer. Failure to achieve one of these goals usually necessitates a second operative intervention, leading to additional impairment of an already compromised quality of life. Whilst conventional treatment of metastatic bone lesions has relied on intramedullary stabilisation or internal fixation, followed by external beam radiotherapy, advances in the oncological management of such patients has resulted in increasing numbers outliving these reconstructions. Therefore, there has been in recent years, an expansion in the use of endoprosthetic replacements for the management of osseous metastases, especially those with a good projected prognosis, including lesions arising from haematological malignancies. This chapter describes the management of a patient presenting with a pathological fracture through a destructive lesion of the proximal humerus on the background of a new diagnosis of myeloma. Due to the pain from the fracture and the good prognosis from the underlying diagnosis, it was elected, following discussion of the options with the patient, to undertake excision and reconstruction of the proximal humerus. Author: Michael Parry MD, FRCS Consultant Orthopaedic Surgeon. Institution: Royal Orthopaedic Hospital, Birmingham, UK.